Why Choose an MAP-built Engine? We won't settle for anything less than the best when it comes to our engine builds. We utilize quality components along with specialized machining and assembly techniques for each individual platform to ensure the best possible performance. If we see a gap in regards to acceptable product offerings on the market we often times develop our own like the Ultimate Duty Connecting Rods. We thoroughly inspect, blueprint, clean and assemble our engines in a clean room and most of the machine work is performed in house to satisfy our stringent requirements. We have had great success in building countless motors for every imaginable application from the weekend warrior to the all out race car. Years of experience and hundreds of successful builds have given us a pretty good idea of what these motors like! If you're looking to make up to 650whp without having to worry about your bottom end you've come to the right place! Looking to make more than 650whp? Check out our stage 2 shortblocks below! The 2.0L retains the factory crankshaft and connecting rod configuration so there is no need for custom parts here as there are a plethora of options on the shelf at all times! 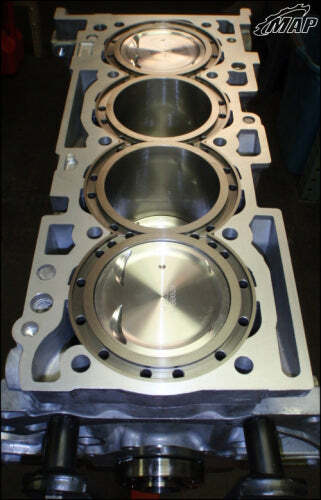 * Engine blocks visit our hot tank before and after machining for a clean, finished appearance. * Crankshafts are never cut / turned and receive a micro-polish treatment and balancing specifically for high performance applications. * The machine work process starts with a three step honing process utilizing a 4B11T specific torque plate to ensure roundness. Our three step honing process is finished with a plateau hone for the absolute best cylinder wall finish and ultimate ring seating. * The last step in the machining process is resurfacing. We pride ourselves on the surface finish (RA) we achieve as it is of the utmost importance in regards to head gasket sealing. Available Pistons - Wiseco / CP / JE and more! * Crankshaft: We use standard size OEM crankshafts most frequently as we have not had a crankshaft failure to date. However, we realize that cores are hard to come by and there are weight advantages with some aftermarket crankshafts so we will happily build your shortblock accordingly! Our stage 1 shortblocks do not feature an overbore as the stock sleeves get too thin for our liking at .020" over. As such, we require that your core be in pristine condition so that any defects or blemishes in the cylinder wall can be removed in our honing process. If your core is not acceptable we can either build from a new OEM shortblock or build you a stage 2 shortblock that features aftermarket sleeves as outlined below. MAPerformance Stage 2 Shortblock for Evolution X Starting as low as $4549.99 W/ Core Exchange or $6949.99 With No core Required! Our stage 2 shortblock retains the factory crankshaft and connecting rod configuration and features Darton MID sleeves for the ultimate in strength and durability! Pistons are available in 86mm (2.0l), 88mm (2.1l) and 90mm (2.2l) for those that would like to take advantage of the additional displacement capabilities of a sleeved block! All Stage 1 services/components with the additional benefits of professionally installed Darton MID Sleeves. Sleeves will increase the overall strength of your shortblock while allowing for larger bore diameters measuring up to 90mm! Our stage 2 shortblocks feature Darton MID sleeves, meaning that just about any cylinder wall blemish can be overcome. However, If your core is not acceptable (hole in the block, etc) you can purchase a new OEM shortblock to start with as well. Last edited by Maperformance; 12-28-2010 at 10:14 PM. MAP is your number one source for engine internals! We pride ourselves on offering our customers the best of both worlds. Unbeatable pricing along with unmatchable customer service and support. Whether this is your very first engine build or you are just looking for spare engine parts for your track car MAPerformance has you covered. We have experience with the products we sell and are glad to share our knowledge. Contact us today to find the right combination of parts to make your dream build a reality! We can also get OEM short blocks if you are interested in just doing an OEM replacement. Or maybe you are looking for a bare black and crank yet again we come to the rescue. PM me for pricing and availability. Last edited by Maperformance; 07-18-2011 at 10:48 PM. A powerful contender has entered the built block arena. I will be getting my block from MAP in the upcoming year for sure. My Master DIY Headlight Mod Thread. Their prices are right in line with the other shops in the arena. If you already have a working relationship with MAP, which a lot of people do, this is a perfectly logical, awesome choice. You go from ordering a fuel pump, to injectors, to a turbo, to, oh, I need a motor. What's that, you say? You offer motors to? And I can just deal with you? I love MAP. Way to go!